The Football Front: Just How Good is Scott Parker? Now, if you ask 10 people who in their view is the best signing of the Premier League 2011/12 season, 3 out of the 10 people would probably say Scott Parker. I’ve always been a bit confused by this. Firstly, I don’t think Scott Parker has been that amazing for Tottenham. Yes, he’s been very tidy and solid for Spurs. But has he really been the best signing of last season? I’m unsure, especially considering the impact Sergio Aguero had on Man City. But let me be clear. I don’t hate Scott Parker. I do think he is a very good DM, perhaps one of the best in the Premier League. He can pass, tackle and retain the ball sensationally. While his personality makes him extremely likeable too. Parker is tenacious, determined and selfless in his pursuit to win. I just feel he is a bit overrated, that’s all. But how does Tottenham’s Scott Parker match up with other leading defensive mids in the Premier League? Without a shadow of a doubt, having fantastic defensive stats is imperative for a top class defensive mid. It kind of goes without saying. But Parker’s defensive stats, are decent. But they are by no means amazing, but they aren’t poor either. In terms of tackles won, Parker sits right in the middle out of the players analysed. One of Parker’s strengths is his tackling and it does reflect in the stats. But he is by no means the best tackler in the Premier League. Lucas Levia had the best tackle win percentage, he won an impressive 76.47% of his tackles. It’s interesting the player with the worse tackling win percentage is Tiote. I feel for such a solid, mobile and imposing midfielder, Tiote should be winning far more tackles. Looking at Tiote’s stats generally, they aren’t impressive. Perhaps this is why clubs such as United and Chelsea have cooled off interest in the £20million rated man. One of the parts of Parker’s game which I feel is often underrated is his reading of the game. If you watch him closely, you can tell he read the game very astutely. Parker may look like a bull in a china shop, but I feel he often gets away with this thanks to his good understanding of the game. He can roam out of position, pick up the ball and move it on for his team within a matter of seconds. Parker made the most interceptions out of the players analysed, by quite a bit too. What I find intriguing is that the top three interceptors are the English lads, Parker, Carrick and Barry. This little stat tell us, that in certain positions, English players really do understand their role and do have a football understanding. Sometimes English players are portrayed as clueless footballers whose best abilities are their courage. One defensive area where Parker lags behind is aerial duals. The other defensive mids are far comfortable in winning balls in the air. But there are other aspects to Parker’s defensive games which isn’t that great either. Parker has made the most defensive errors out of the players analysed, this correlates with the number of times he has been disposed too. The number of times Parker has been dispossessed has surprised me. I always felt one of the strengths of Parker’s game was his ability to retain the ball, but obviously, he is either spending too long on the ball or opposition are closing him down quickly as they know he’s not the fastest nor the most agile of players. But what’s incredibly impressive is how Gareth Barry, in 34 games was only been dispossessed 17 times. Faurlin only played 20 times, yet he lost the ball nearly double the amount of the Man City man. Barry may not be everyone’s favourite footballer (to hell, no one really likes him), but he certainly is very tidy and does the job in a disciplined manner. Now, the attacking abilities of a defensive mid are not that vital as say as a winger, striker or an attacking midfielder. But, it does give an indication on how well rounded the player is and how influential he is. In terms of passing, Scott Parker has seen a lot of the ball. It does show how influential he has been for Spurs. But, what I find more interesting is the accuracy of Parker’s passing, the England international’s pass accuracy was 90%. It was the best alongside United’s Michael Carrick. Without a doubt one of the strengths of Parker’s game is his ability to pass accurately. This is of course, is very vital if you’re a defensive midfielder, as one of your roles is to link the defence to the midfield. 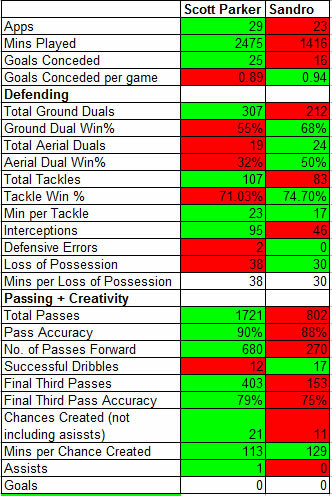 Now, this is an intriguing comparison, due to both playing for Spurs and both being defensive midfielders. By the end of the season, Redknapp often played both players, but Sandro was utilised in a more defensive role than Parker. But looking at the defensive stats, Sandro dominates Parker. The Brazilian has a better Aerial win percentage, a better ground dual percentage and a better tackle percentage too. But both players seem to have a weakness in retaining the ball. This maybe a concern to Spurs, as losing the ball in the central areas of the pitch, is catastrophic especially with Spurs being a dynamic attacking side. For me, Sandro looks the more comfortable in defensive mid, he has the ability to not only keep it simple, but he does the basics well enough. This is a hard one. Parker, Barry and Carrick are players of very different styles. In some respects, one of the three (Carrick ) is arguably England’s best passer, while another (Barry) is probably England’s best keep it simple player and the other one, Parker is probably the most comfortable in attacking and defending. From a creative and passing perspective, Carrick edges Barry and Parker. Carrick made the most passes and had the best pass accuracy. From a defensive perspective, it’s very close again too. But looking at the stats, I feel Carrick is the most comfortable defensively. Out of the three, he had the best win percentage for aerial duals, ground duals and came second best for interceptions. Carrick may not be the most dominating of midfielders, but for me he’s more rounded than Barry and Parker. Some may argue, Carrick isn’t a defensive mid, I firmly believe he is. Of course, he isn’t a typical defensive midfielder. He is one, like Parker, who joins attacks when the momentum is with his side. It does surprise me how Carrick is under used by England. If England are really determined to keep the ball, Carrick must be utilised. He is someone who keeps things ticking in midfield, and off the ball he can win his fair share of duals too. But with the same token I can see why England managers have chosen Barry and Parker. Both lads add reliability, grit and drive to England. Look at Barry, he rarely loses the ball. While Parker, reads the game sensationally well, something that is crucial for international football. So, just how good is Scott Parker? Well, he certainly is a good footballer. He is a player most teams wouldn’t mind having knocking about. But is he the best defensive midfielder in the Premier League? In my eyes and in the eyes of the stats, he isn’t even the best English defensive midfielder either. One could easily argue, Barry or Carrick are better defensive midfielders. If had to choose between the three, I would pick Carrick. The reason why Parker is rated, respected and admired so highly is because of his style of play. He is tireless, determined and visibly hungry to win, not only that he has got some good technical abilities. 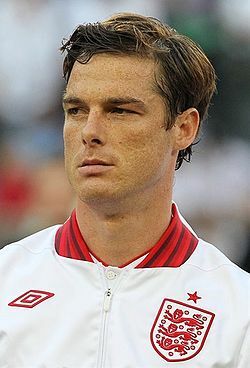 I think Scott Parker is a top defensive midfielder, but he is by no means the best in the Premier League. But that leads me to the question, who is the best defensive mid in the Premier League? For me, (and again like most things, it comes down to personal taste) I think Lucas Levia is the best defensive mid in the Premier League. As the stats show, he is the most well rounded and I feel his linking up play is fantastic too. While for Scott Parker, he is proof that, you are never too old to fulfil your potential. I feel some of the hype towards Parker is over the top. I think he is a good footballer, but by no means the best defensive midfielder in the Premier League. The UK press and fans probably love him, as he typifies the idyllic English player. He is courageous, selfless and passionate. But the reality is, he just another good defensive midfielder in the Premier League.